Summer is approaching. Not a favourite season for most of them with the mercury rising higher, but then the season brings along with it school vacations and people take advantage of these holidays to visit the beaches, spend more time outdoors and enjoy various sports. In such a scenario, precautions should be taken before the rising temperatures create problems such as dehydration, sunstrokes, etc. It is very essential to keep the body cool and prevent such episodes by drinking plenty of water, juices, buttermilk, lassis and eating more fresh fruits, salads, curds. The best way is to include various salads/ raitas in our daily menu. 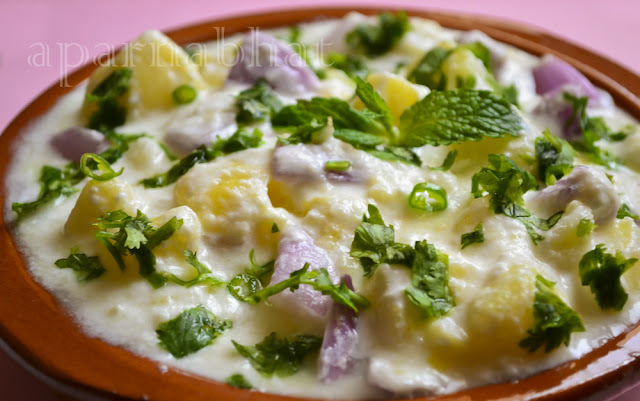 I prefer to add curds in these salad/raita recipes which surely helps to have a cooler effect on our body. Today, I am posting a simple and refreshing salad recipe. Mix boiled potatoes with chopped onions, minced green chillies, curd, asafoetida, finely chopped coriander leaves and mint leaves. Add salt to taste. Yummy potato onion salad/raita is ready.